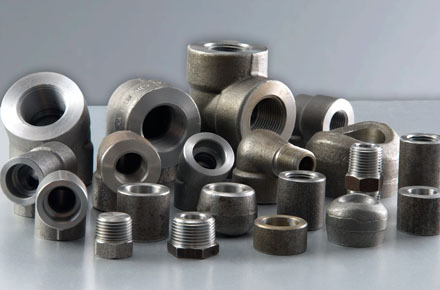 ACE ALLOYS LLP is a leading Duplex Steel Socket Weld Fittings Manufacturer. The name duplex steel is derived because of the two phases in the structure, the face centred cubic lattice and body centred cubic lattice present in roughly equal proportions. Duplex steel socket weld pipe fittings possess good mechanical properties and excellent corrosion resistance. This fitting is in high demand in the oil and gas industry and also chemical industries. They are also used in the building and construction industries. Duplex Steel Socket Weld Pipe Fitting offers superior corrosion resistance but is quite difficult to process. They are known for their mechanical properties and possess great strength. Duplex Steel Forged Socket Weld Fittings are used for their excellent finish. We are a quality duplex steel socket weld pipe fittings supplier offering duplex steel socket weld full coupling, duplex steel socket weld cap, duplex steel socket weld cross, duplex steel socket weld tee, duplex steel 90 degree socket weld elbow, duplex steel socket weld reducers to our esteemed customers. The ASTM A182 Duplex Steel Socket Weld Pipe Fittings, Duplex Steel 2205 Socket Weld Fittings, Duplex S31803 Socket Weld Fittings are the common grades of fittings that are demanded by our customers. These fittings comply with all national and international standards. Through years of experience and service ACE ALLOYS LLP understands your needs. We assure you the best quality products at reasonable prices. Do contact us and give us a chance to serve you. Request the latest Duplex Steel Socket Weld Fittings Price List. Use the contact button below for Duplex Steel Socket Weld Fittings Ready stock information and updated price list.